How Can I Get Involved in the Independent Bookstore Movement? Independent Bookstore Day Charis Grand Reopening Party! Yoga at Charis--New start time! The National Book Award winning history of how racist ideas were created, spread, and deeply rooted in American society. Some Americans insist that we're living in a post-racial society. But racist thought is not just alive and well in America--it is more sophisticated and more insidious than ever. And as award-winning historian Ibram X. Kendi argues, racist ideas have a long and lingering history, one in which nearly every great American thinker is complicit. In this deeply researched and fast-moving narrative, Kendi chronicles the entire story of anti-black racist ideas and their staggering power over the course of American history. He uses the life stories of five major American intellectuals to drive this history: Puritan minister Cotton Mather, Thomas Jefferson, abolitionist William Lloyd Garrison, W.E.B. Du Bois, and legendary activist Angela Davis. As Kendi shows, racist ideas did not arise from ignorance or hatred. They were created to justify and rationalize deeply entrenched discriminatory policies and the nation's racial inequities. In shedding light on this history, Stamped from the Beginning offers us the tools we need to expose racist thinking. In the process, he gives us reason to hope. Ibram X. Kendi is an award-winning scholar and a New York Times bestselling author. He is Professor of History and International Relations and the Founding Director of the Antiracist Research and Policy Center at American University. His second book, Stamped from the Beginning: The Definitive History of Racist Ideas in America, won the 2016 National Book Award for Nonfiction. At 34 years old, he was the youngest ever winner of the NBA for Nonfiction. 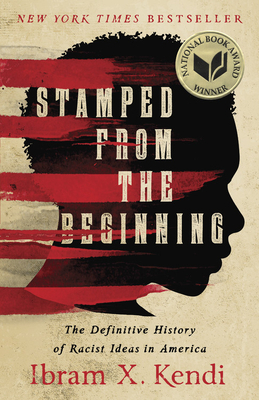 Stamped from the Beginning was a finalist for a National Book Critics Circle Award, and it was nominated for a Hurston/Wright Legacy Award and a NAACP Image Award. Stamped was named to several Best Books of 2016 lists, including by the Boston Globe, The Root, the Washington Post, and Buzzfeed. Kendi is the author of the award-winning book, The Black Campus Movement: Black Students and the Racial Reconstitution of Higher Education, 1965-1972. He has published essays in numerous periodicals, including the New York Times, Salon, Time, the Washington Post, and the Chronicle of Higher Education. He has provided commentary on a host of local, national, and international radio and television outlets, including NPR, PBS, CNN, BBC, Al-Jazeera, Democracy Now, and Sirius XM. He has received research fellowships, grants, and visiting appointments from a variety of universities, foundations, professional associations, and libraries, including the Library of Congress, National Academy of Education, Rutgers Center for Historical Analysis, Brown University, and Princeton University. He was named to The Root 100 2017, and recognized as the most 29th most influential African American between the ages of 25 and 45. His next book, which will be published by One World/Random House, is tentatively titled, How to Be an Antiracist: A Memoir of My Journey. "We often describe a wonderful book as 'mind-blowing' or 'life-changing' but I've found this rarely to actually be the case. I found both descriptions accurate for Ibram X. Kendi's Stamped from the Beginning... I will never look at racial discrimination again after reading this marvellous, ambitious, and clear-sighted book." "Ambitious, well-researched and worth the time of anyone who wants to understand racism." "I honestly wish every American would read this book, especially people who haven't been exposed to the history of blatant, transparent racism in our public policy." "Perhaps the most significant book of 2016, this National Book Award winner is a lucid, highly readable look at the origins of racist ideas in the United States." "Both a penetrating treatise and a wonderfully accessible work of intellectual history, Stamped from the Beginning reveals the heritage of ideas behind the modern dialectic of race-denial and race-obsession. By historicizing our entrenched logic of racial difference, Kendi shows why "I don't see color" and other professions of post-racialism remain inexorable alibis for white supremacy. Stamped from the Beginning has done the cause of anti-racism a great service." "In his ambitious, illuminating, and engaging book, Ibram X. Kendi seamlessly assembles sources from Cotton Mather to Angela Davis; the Great Awakening to Black Lives Matter; the Birth of a Nation to Hip Hop culture, to show how not only race but racist ideas are at the center of American thought."